Driving eastwards past the 150 year old mining engine house chimney - a lieu de mémoire for the dark dirty-secret past of this green and pleasant corner of England. This is the old Salt Road. Salt was carried from the Cheshire 'witches', the towns of Middlewich, Nantwich and Northwich, to the port at Chester, and later Liverpool, to trade with Africa and Asia. Up the steep Coppermine Lane to reach the top of the ridge. Squeezing in amongst a crowd of Sunday cars on the side of the road. The path heads off. A stony farm road leading first west and then south towards Whitchurch. 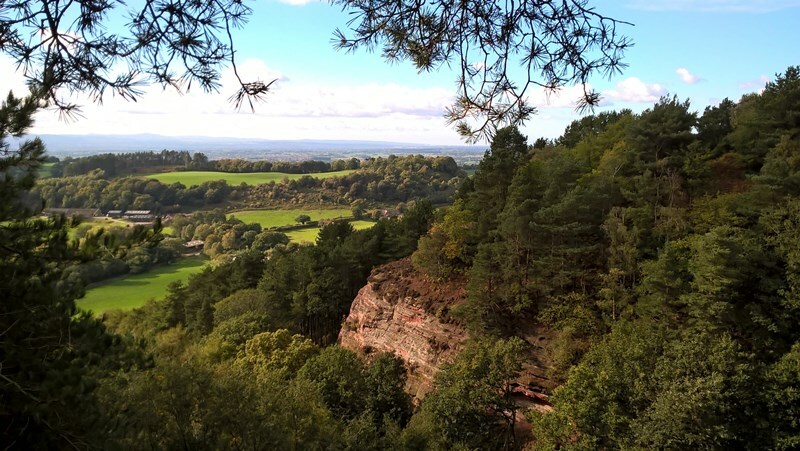 This is the Sandstone Trail tracing the sandstone ridge along the western side of Cheshire for 55 kilometres. prickly sweet chestnut tempting hungry squirrels. north across the Mersey, the solid square-built sandstone tower of Liverpool’s Anglican cathedral; closer, a cluster of slim flame-topped stacks pinpoint the oil refineries at Ellesmere Port. Closer still the Roman City of Chester hunkers down on the banks of the river Dee all but hidden in the folds of gentle rolling green pasture, that most English of English landscapes extending to the very edges of the country before drowning in the waters of the Dee. Across the fields to the east, beyond the giant white saucers of Jodrell Bank, the hazy beginnings of the Pennines. The path narrowly clings to the edge of the soft, red sandstone cliffs. Cliffs formed during the Triassic period 250 million years ago, says the information board, once upon a time, a long, long time ago. Not so very long ago, in the 1220s, Beeston Castle was built on a rocky outcrop, here in bas relief against the sky, a five kilometre walk north on the trail. Once upon another time it was the site of one of the Iron Age hillforts strung out along the ridge like a ‘join the dots’ guide to life here 3,000 years ago. . . . the trail following in ancient footsteps. Steps lead down the side of the hill to a wooden platform. This is Dropping-stone well. Local people climbed up here to fetch drinking water as recently as the Second World War. In the not so distant past servants took sand from the caves which pockmark the soft sandstone to use on stable floors and as a scouring aid in the kitchens of the ‘big houses’. This was a busy, productive place, and not only on Sunday afternoons. Rawhead itself, the trig point and the highest part of the Sandstone Trail stands at 227 metres. Rocks jutting above the trees, there are clear views from here. Over the border into Wales, Wrecsam’s industrial estate stands out against a background of the Clwydian Hills. Shropshire to the south and on a (very) clear day a faint outline of the Wrekin about 30 miles away. The path turns southwards, continuing to snake along the very edge of the steep cliffs. Careful footsteps are needed to avoid sliding over the edge into the canopy of silver birch and scots pine that cloak the sides of the cliffs. Black holes mark caves in the rock faces. A turn to the east. Rhododendrons flood a steep valley. A dull green for much of the year, in spring this ‘alien species’ large purple flowers are a prelude to the native purple heathers and plump ripening bilberries yet to come. crows and farm dogs scrap and shout for attention all year round. Down towards the kissing gate and the farm track. The Sandstone Trail turns towards the main road and southwards to Bickerton Hill. The sign to the Bickerton Poacher points left. This path follows behind the line of the fields and houses which border the main road. Overhung with stray fruit trees, damsons and crab apples tempt those walking beneath. Crossing the muddy stream at the lowest point of the path, then uphill again past the memory of the industrial past: the brick chimney above Gallantry Bank. Buzzards haunt the tall scots pines edging an open field, swooping ghostly shadows a prelude to their loud territorial claims. Shooting parties gather in this space. Gallantry is an elision of ‘gallows tree’. Hiding history in plain sight. Over the stile and a steep climb up Coppermine Lane brings us back to the present. Julia Bennett is a sociologist with an interest in place and belonging. She has lived in this part of Cheshire for 16 years.